Don't wait for weights! Get all you need with the Apollo Athletics Rubber Dumbbell 5-50 lb. Set. This brilliant set is perfect for getting in a great weight routine. (2) 5 lb weights (2) 10 lb weights (2) 15 lb weights (2) 20 lb weights (2) 25 lb weights (2) 30 lb weights (2) 35 lb weights (2) 40 lb weights (2) 45 lb weights (2) 50 lb weights High quality rubber coating. High gloss chrome handle. Hexagonal shape prevents rolling. 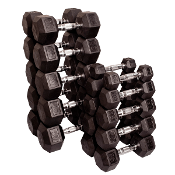 10 Pairs of dumbbells (5-50 lbs). Raised numbers. Great for home gym.